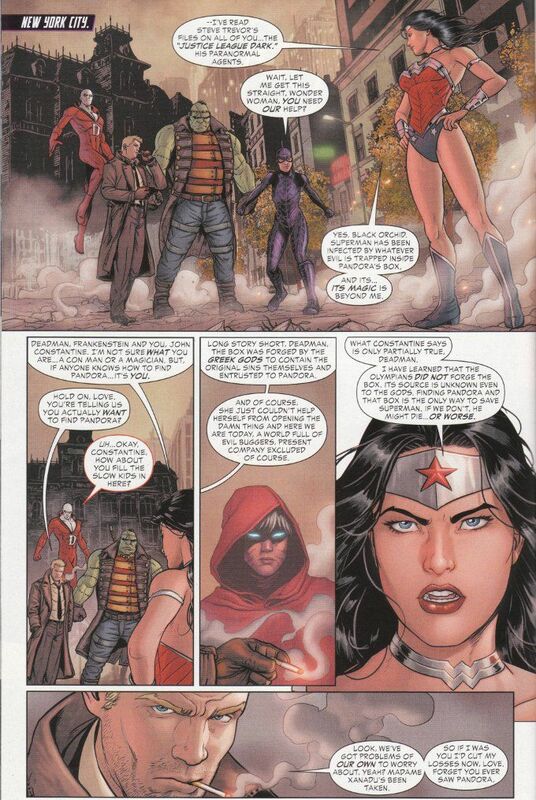 Something about Justice League Dark #22 clicked with me in a way that the previous chapters of The Trinity War didn't. I have yet to put a finger on precisely what that something is, though I have pondered it as extensively as The Question himself seeking an answer. Ultimately, I suspect it comes down to this being the first issue where all the characters are behaving like the heroes and anti-heroes I love. Ignoring the New 52 origins of The Phantom Stranger (who is no longer a stranger) and The Question, this issue gives us visions of these characters as I think they should be in terms of personality and function. The Phantom Stranger shows up promising aid yet offering little information save where to go next. The Question shows up in the middle of a high-security facility to tell our heroes they're barking up the wrong tree and pointing them in the direction of the Secret Society of Super-Villains. And then there's a host of smaller scenes (too many to recall completely) where the characters are allowed to be themselves and bounce off one another, such as when Wonder Woman manhandles an indifferent John Constantine and he, in retaliation, tries to magically entrap her. The action of this issue moves briskly but smoothly. Though there is some dissension between various heroes as to precisely what actions they should be taking, actions are still taken regardless. No time is wasted on petty slug-fests for the sake of slug-fests and the focus on their respective goals is maintained throughout. Jeff Lemire's love and knowledge of these characters comes through in every panel of this book. More, this issue manages the neat trick of recapping the story thus far for those readers who might only be reading Justice League Dark and none of the other Justice League titles - something you don't often see in the third chapter of a multi-book mini-series! Lemire also sets up the story for this month's issue of Constantine without breaking stride for a moment. Mikel Janin's artwork is, in a word, phenomenal. The line work of this issue is clean with all the character designs crisp and distinctive, even in the long-range. The inks are subtle - little more than division lines at times - with soft shading in the coloring being used to alter the visual tone of the character's faces. 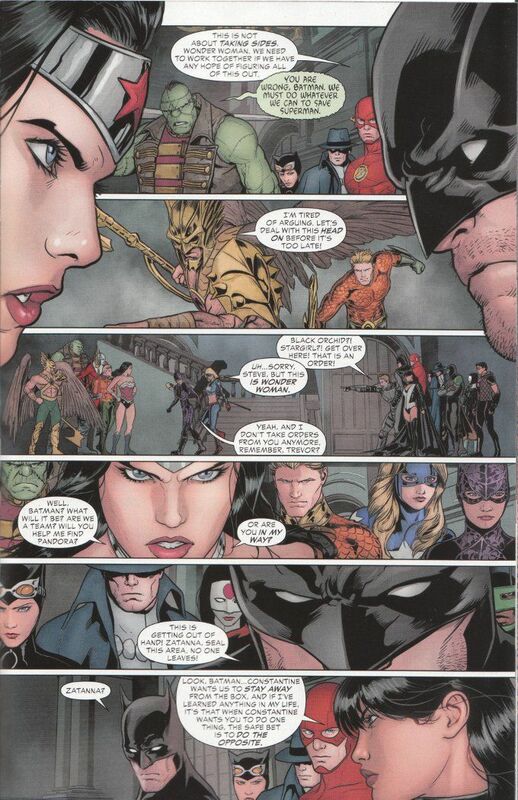 I'm a fan of all the artists working on The Trinity War but if I had to pick the best of the series so far, Janin would be the winner. Bottom Line - if you haven't given Justice League Dark or The Trinity War a try, this would be a fine issue to start with. Good art. Good writing. Great character moments.